This emulator is designed to be plugged into the GVP 530 Turbo or A500HD+ and is capable of using many of the Amiga's resource's for use on the PC such as the serial port, parallel port and floppy drive. 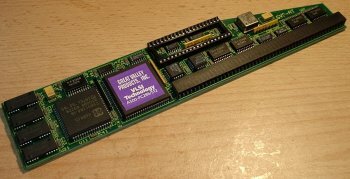 This card is identical to the ATonece Plus card http://www.bigbookofamigahardware.com/bboah/product.aspx?id=347 - just another form factor - the card and software was originally designed and produced by Vortex then used by GVP, hence software for the ATonce Plus can also be used for the GVP card. The GVP HD8 mini slot is just a signal variation of the Amiga 86-pin edge connector for the most part, and the signals there are effectively the same as the 68000 socket as far as this thing goes. Page contributors: Granada, Iggy Drougge, John Klumpp, Robert Miranda (GVP Tech Support).